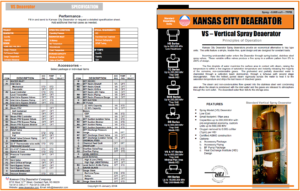 Kansas City Deaerator Spray deaerators provide an ecomical alternative to tray type units. The units feature a simple, trouble-free, quiet design and are designed for constant loads. Incoming undeaerated water enters the Deaerator through spring-loaded, stainless steel spray valves. These variable orifice valves produce a fine spray in a uniform pattern from 5% to 200% of design. The fine droplets of water maximize the surface area in contact with steam, raising the temperature to within a few degrees of saturation temperature and instantly releasing the majority of the corrosive, non-condensable gases. The preheated and partially deaerated water is channeled through a collection basin downcomer, through a tortuous path second stage deoxygenator. Here the hottest, purest steam vigorously scrubs the water to heat it to the saturation temperature and strips the last traces of dissolved gases. The steam and non-condensables flow upward into the stainless steel vent condensing area where the steam is condensed with the inlet water and the gases are released to atmosphere through the vent outlet. The deaerated water then falls to the storage area.